Many Land Rover Defenders pass through the workshop doors at ACHSV every year. Most of them come in for improvements be it cosmetic, mechanical or both. As we are dealers for the main Premium Off-Road brands we can offer a wide variety of accessories to compliment your Defender. Brands such as ARB, WARN, Front Runner and Vision X. This particular Defender came to us straight from the showroom. It was a 2015 model 90 Station Wagon XS, now it’s a little more than that. 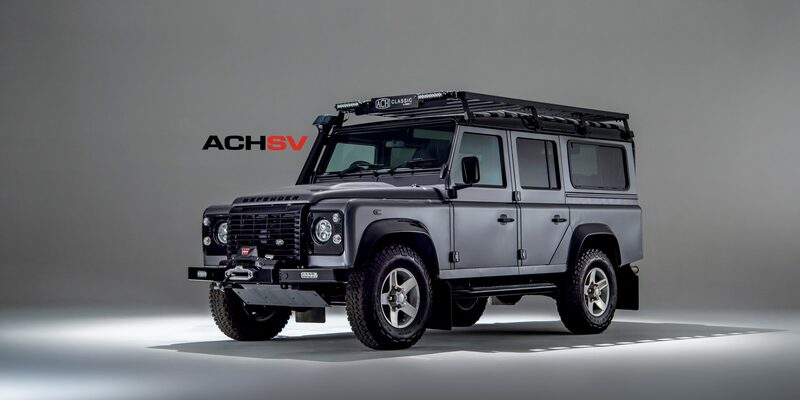 This Defender’s Enhancements include Factory Snorkel, Front Runner roof rack and Ladder. Lighting comes from 2 x 10″ Wilderness LED roof mounted light bars, JW Speaker LED headlamps, LED side light bulbs and LED daytime running lights. A WARN Zeon winch with synthetic rope is fitted to a steel winch bumper and a factory steering guard finishes the job off…..well nearly. The key to what we do at ACH is attention to detail and the finish is one of our main focuses. So this Defender has gloss back arches, roof, roof rack, snorkel, ladder, side steps, front bumper, rear cross member, mirror backs, headlamp surrounds and grille. All these parts are painted in our paint shop. This makes this a one of a kind Defender that stands out from the rest. The customer who owns this beast originally only came in for some different wheels. Then once he had had a walk around the showroom things got carried away. Originally pretty scruffy in Java Black with standard wheels and quite a few dents, this 2006 TD5 Defender 90 Hard Top went through a complete makeover. Firstly the body was straightened out and all ancillary components were removed. Then the Avery grey matt wrap was applied to all of the panels with the exception of the roof that retained the black. The arches, headlamp surrounds and grille we all painted gloss black before all the extras were added. New 18″ Sawtooth alloys with Cooper STT pro tyres gave it a new stance along with a 2″ lift care of Terrafima springs and shocks. A Terrafirma winch and bumper added the protection at the front with a Front Runner Slimline II rack and ladder with a 40″ Wilderness light bar up top. Some rock sliders and a Safari snorkel finished the job off . One of the key parts to many of our Defender enhancements is the paint work.